Fuchka shell is quite similar to North Indian golgappa or panipuri shell. 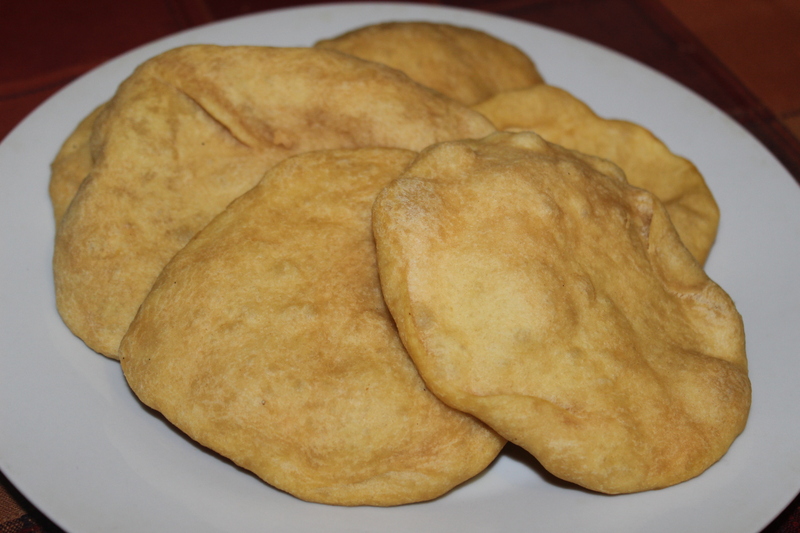 In Bangladesh a special ingredient "taalmakhna" is used in the dough to make the shell puffed up and crispy . But in USA , since it's hard to find that special ingredient , I always made fuchka shell without it and alhamdulillah always came out great . 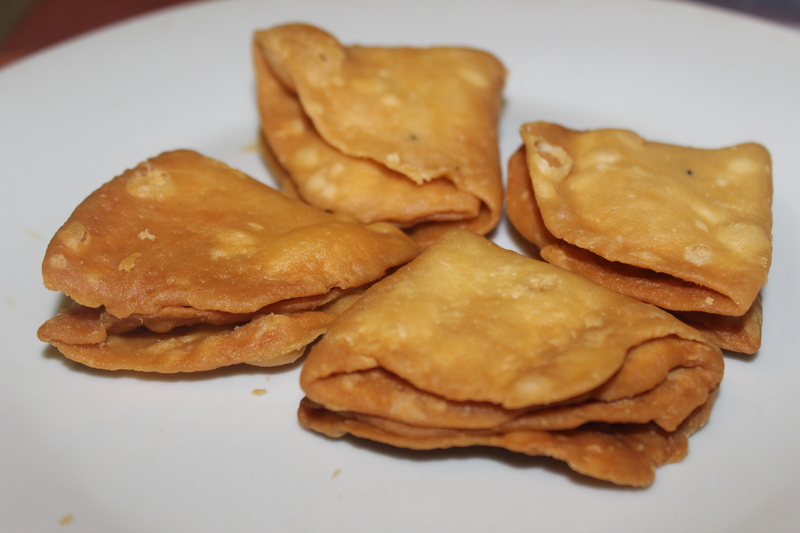 So those who think , fuchka shell cannot be made without it , just get prepared to make some fuchkas without it !! 1. The oil needs to be hot but not smokey hot . If the oil is not enough hot , it won't puff up . 2. After rolling out the dough ball, cut into small disks with small round shaped object to give the shape of fuchka . And fry immediately . Don't let it rest . Just cut one and put it immediately in the oil . If it is left open in the air before frying , it will not puff up . If for any reason you cannot fry immediately just cover them with a damp cloth . 3. Don't fry too many at a time . If they don't get enough space in the oil to puff up , they will remain flat . So fry few at a time . 4. Don't use any baking powder or baking soda . You can make better , puffed up fuchka without them . 1. Make a stiff dough with semolina , maida , salt and water . Cover it with damp cloth for at least 30 minutes . After 30 minutes the dough would seem very tight and stiff . This is the way the dough should be . Make 2 equal sized balls with the dough . 2. Heat oil at medium low flame . Start heating oil long before you start rolling the dough as you need to fry the shells immediately after rolled out . By the time your shell is ready to fry , the oil need to be hot but not smokey hot . 3. Now working with one ball at a time , roll it on a flour dusted surface . Make sure you covered the other ball with damp cloth . While rolling , you need to apply little pressure as the dough is very tight . Roll it to a large disk . It shoudn't be thick or too thin . If it's too thin , it won't puff up and if it is too thick , it won't be crispy inside . 4. Cut the disk into small fuchka shells with something round shaped object . Cut one and immediately put it in the oil . Cut another put in oil . So finish all of them this way . Splash some oil with the slotted spoon over fuchkas to puff up . 5. Don't fry too many one at a time , as they need space to puff up . Fry few at a time and fry at medium -low flame for a longer time for crisper inside out version . If the oil is too hot or you fry them at high heat , the shell will have color from outside , but would remain soft inside . 6.When done place them on a kitchen towel to remove any extra oil . It would help to store them for a longer time without any smell and without being soggy . Store them when cooled down , in an air tight container. Kati roll or Kathi roll is the famous Street food of Calcutta , where skewered kababs are wrapped in paratha with chutneys and other condiment . 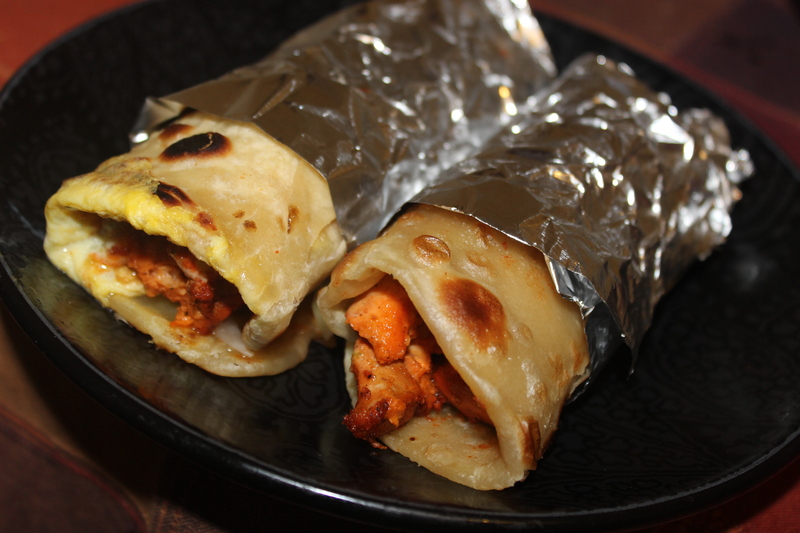 As the kabab is skewed in a bamboo skewer ( kathi/ stick) , the kabab roll is known as Kathi roll or Kati roll !! 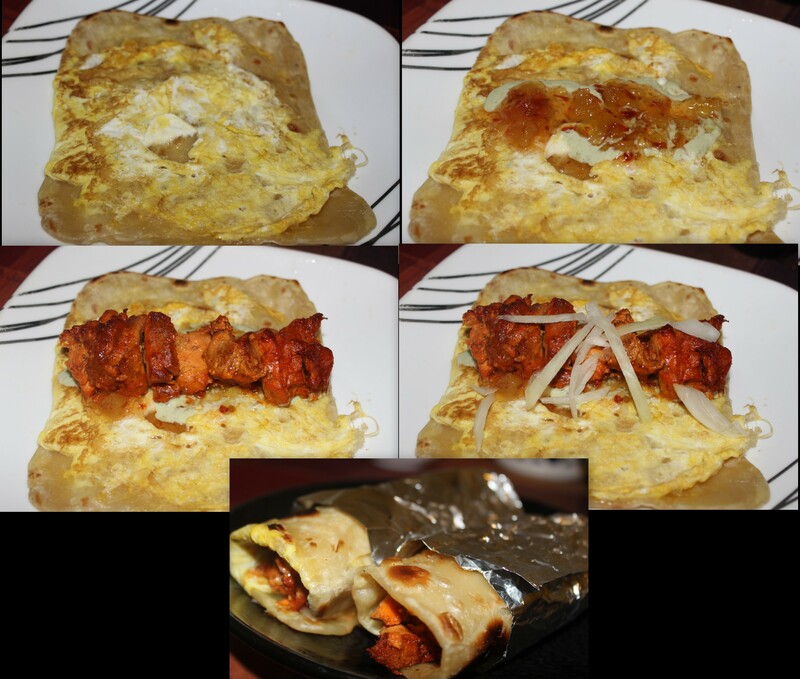 It’s a special kind of roll , where the parathas are semi cooked then again an egg is cracked on top of the paratha , the egg is fried on the paratha to stick on to it , then layered with kababs , various chutnneys and other condiments like cucumber , onion etc . 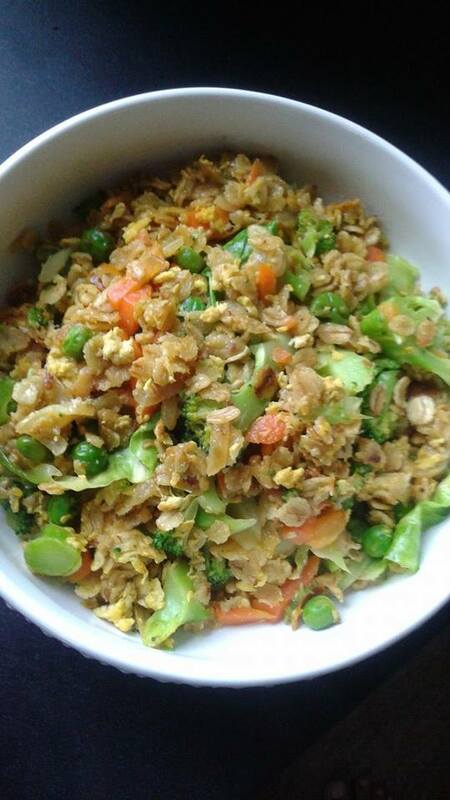 This is my version of Kati roll with two chutney recipes . I took store bough pineapple preserve , pineapple marmalade will do too . Add little chili garlic sauce into it and beat with a fork . Hot and sweet cheater version of pineapple chutney is ready . Mix everything together and green dahi chutney is ready. 1. Fry the parathas first . 2. Put 1 tea spoon oil on the fry pan and add beaten egg ( beaten with little salt) . Spread the egg on the pan like omelette . 3. Place one fried paratha over the “still wet but little firm” egg to set . 4. 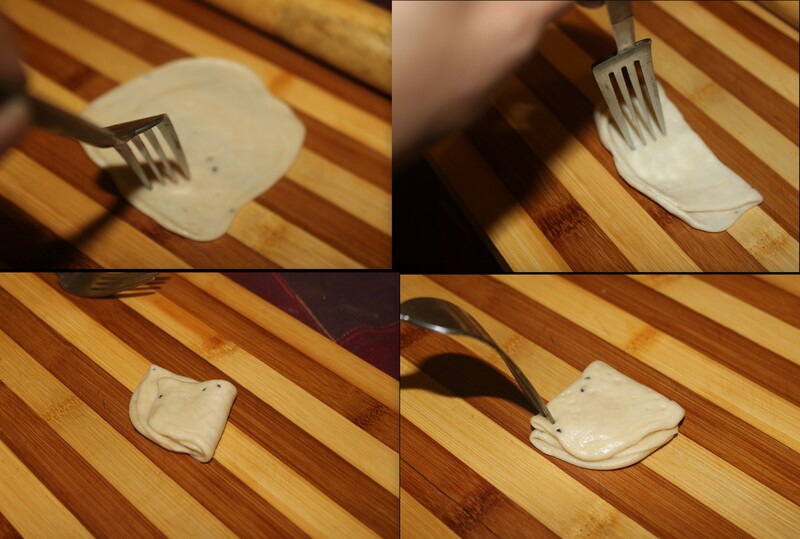 Flip the paratha and transfer to a plate . 5. Add little green dahi chutney . Add pineapple chutney , then add the kabab and some thinly sliced oniln . Roll it over . 1. Take a bowl and put flour and ghee . Mix with your finger tips . The mixture will look like bread crumbs and somehow binds together if press hard . This is called moyan . Now add the water slowly and knead lightly until a soft but firm dough is formed . Cover the dough with a warm cloth and keep it aside for at least half n hour. 2. Make small balls from the dough .Roll the balls on an oiled surface and make small , thin disks. Now prick the surface of the disks with a fork . That would help not to puff up . Now fold the disk and prick all over once again . Fold Again and nor lightly prick on few places , like edges and middle . Try to roll the balls as thin as possible . In the pic I did it in hurry , so it may seem like little thicker . But in fact I really rolled it very thin . 3. Deep fry the nimkis in hot oil at low flame until brown and crispy . Now frying is very important . If you put them in very hot oil , they will get browned earlier before they are done . And if the oil is not hot enough the nimkis will absorb to much oil leaving it soggy . If you don’t fry them for longer time at low flame they will not become crispy at all . 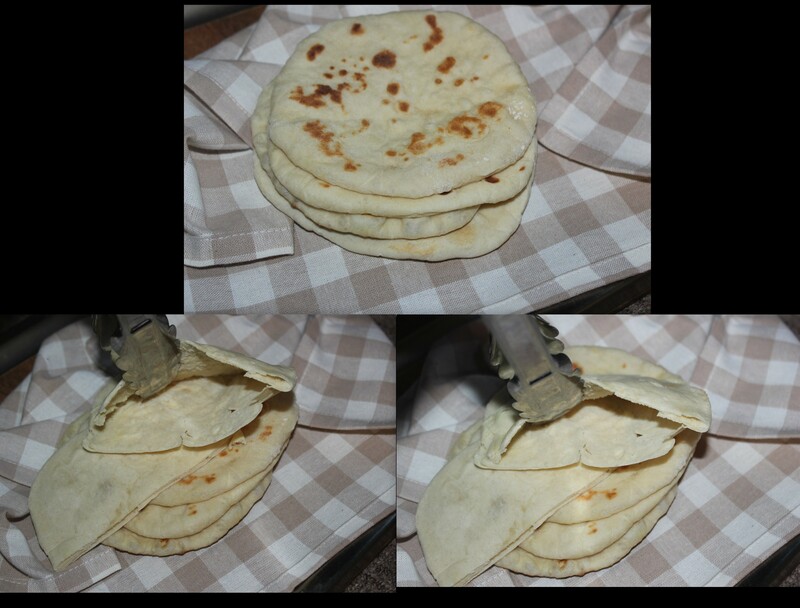 I don’t know , why it is named as Bosnian roti as there is no connection with the original Bosnian bread lepenja. This one is completely our Bangladeshi version ,where the bread dough is leavened with yeast and then rolled out and deep fried . 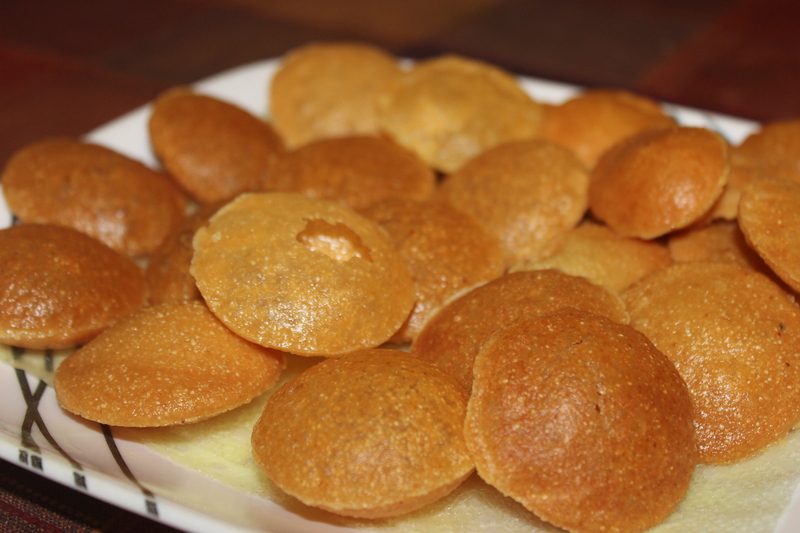 Though deep fried , they don’t look oily and doesn’t get soggy even after cooling down unlike luchi or poori . 1. Make a dough using the ingredients . Now place it ina oiled box . Close the lid and let it rest for 2 hours in a warm place . 2. Now Make small ball s from the dough and roll the balls medium thick . Deep fry the rotis . Don’t fry too much . 1. Take one chicken breast . Now marinate it with olive oil , salt, 1/2 tbl spoon black pepper , 1/2 tea spoon cardamom powder , 1/4 th tea spoon clove powder, 1/4 th tea spoon nutmeg and 1 tea spoon all spice powder . Now grill it or bake it in a preheated oven for 25 minutes at 400 FH . Broil for another 10 minutes at the same temperature . 2. Now cut the meats from the breast . Mix in with Tzatziki sauce . You can cook the chicken in many other ways too . Sometimes I marinate the chicken stripes in soy sauce , oyster sauce , ginger paste and vinegar . Then fry them in oil . 1. 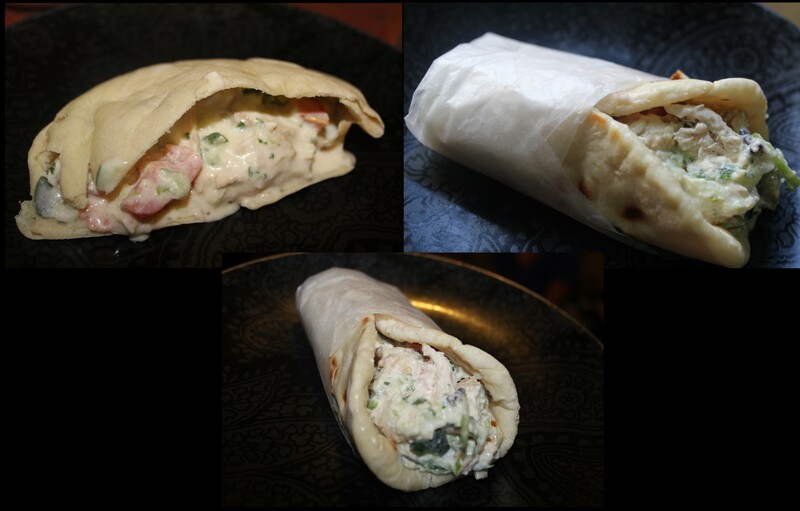 Spread hummus on the pita and place the chicken mixed in Tzatziki sauce . Now add some tahini on top and roll . 2. For pita pocket sandwich , cut the pita into halves . Put the chicken , tahini and hummus in the pocket and serve . Roti Telur is Indonesian / Malaysian version of stuffed paratha , quite similar like our Bangladeshi style mughlai paratha , but only difference is roti telur is much more thinner than our version . 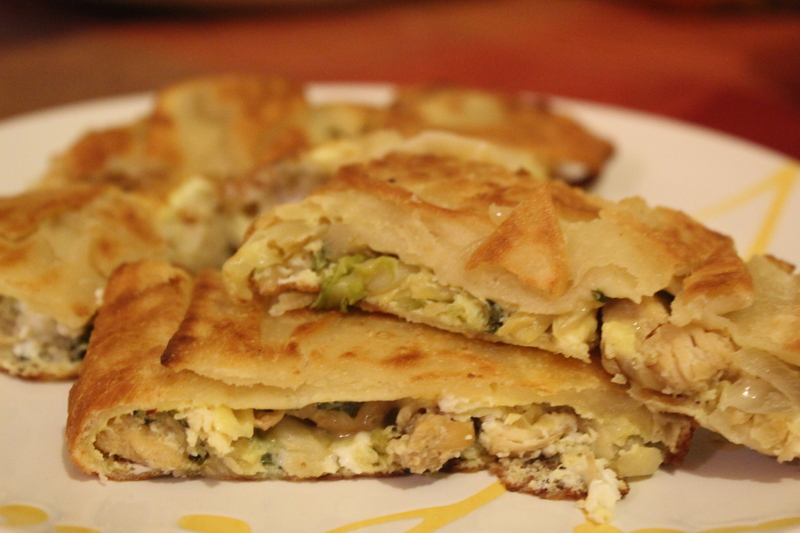 Usually roti telur has only egg as stuffing , but I used chicken too . Mix the chicken with soy sauce , ginger paste , chili paste. Heat oil and add the chicken pieces . Fry until tender . Add the cabbage . fry for a while . When the cabbage is soft turn off the stove . If needed sprinke some salt . Now add the sliced onion and chopped gree chilies and mix with the hot chicken . Beat an egg with little salt . We will use it later . 1. Mix 2 cups flour with 2 tea spoon sugar , salt, baking powder and 1 tbl spoon ghee/ oil/ butter . Add enough water or milk to make a medium soft dough . It took me around half a cup of milk . Cover with a wet cloth. Now let the dough rest for at least 1 hour . The dough will be very stretchy . 2. Make 5- 6 balls with the dough . Flatten by your palms and submerge the balls into enough oil . Let it rest for another 10 minutes . 3. Rub oil on the working surface and all over the rolling pin . Now start rolling the balls . Roll until paper thin . 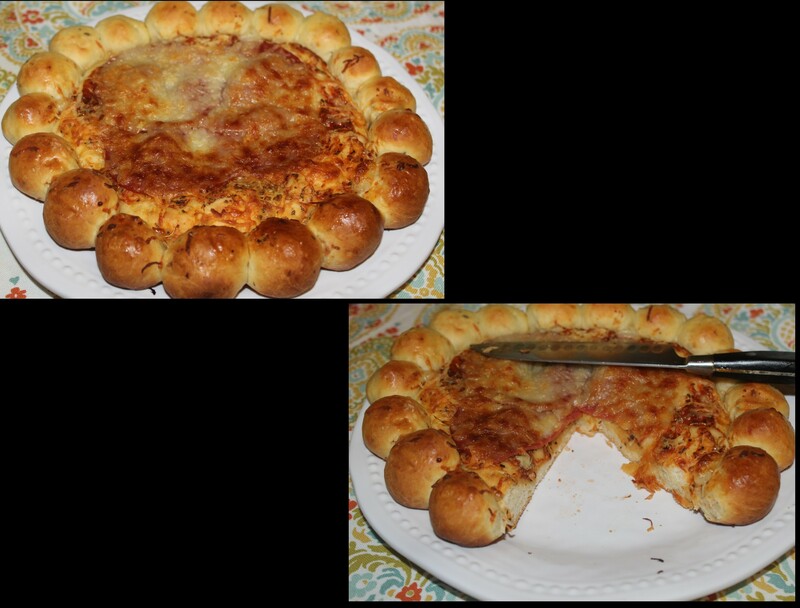 You will find it easier to roll out , because oil and the stretchy dough will help you to complete the job . 4. Rub some butter/ shortening or dalda on the paper thin sheet . Dry out with loose flour . It would make the paratha flaky. Now spread the filling evenly . Add the beaten egg on the top of the filling . Now fold it like an envelope. Try to do all these near by the stove , since the roti is vey thin , it may get ripped off . And don’t use hot filling that would also tear off the roti . Immediately place it on hot oil . 5. It doesn’t need to be deep fried , but you need enough oil to fry the roti . Fry on medium low flame . Veg Pizza from scratch !! We had one of our American friends at our place for lunch . He is vegetarian but not vegan . 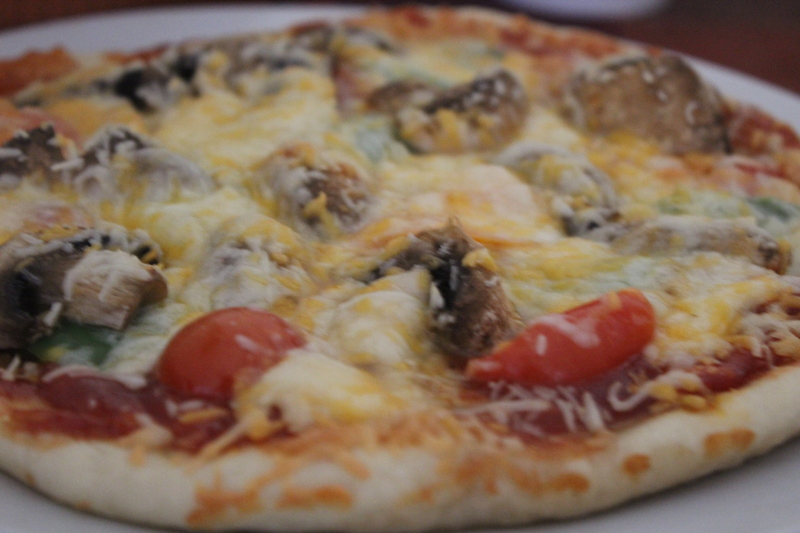 So decided to make veg pizza though not completely a vegan one as I used generous amount of garlic in the sauce . Everyone enjoyed the pizza including my meatlover daughter . 1. Mix flour with sugar and salt . Now add the yeast and 1 tbl spoon oil . Now add the little warm water slowly to form a medium soft dough . Don’t add too hot or room temperature water . Too hot water may kill the bacteria of yeast and room temperature water will not activate yeast , both resulting in not risen up dough . Add other 1 tbl spoon of oil . Knead very oil . The more you knead , the better is the result . The dough must be smooth . If you find your hand little sticky ,wet your hand with little oil and knead . Make a ball out of the dough .Now rub 1 tea spoon oil all over the dough and keep it in a greased closed lid box in a warm plac for an hour or more or until it doubles up . 2. In the mean time make the sauce combining al the ingredients . 3. When the dough doubled up, punch down all the air from the dough and roll it in two thin round disks on a lightly flour dusted surface . 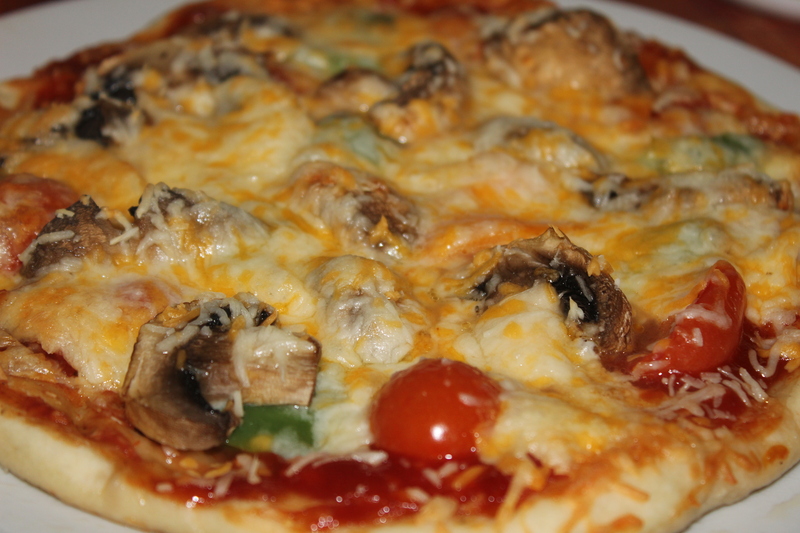 You can prick the surface of the pizza with fork , if you want it thin, so that it won’t rise much in the oven . Don’t forget to preheat the oven to 450 FH .